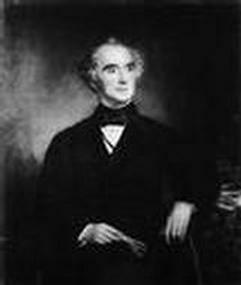 Formula milk was invented in 1867 by a chemist called Justus Von Liebig, who developed the first commercial formula, Liebig’s Soluable Food For Babies. Prior to this time, mothers who could not breast feed or rich mothers who chose not to, would have employed a wet nurse (another lactating woman) to breast feed their baby. This practice is now called cross-breast feeding or cross-nursing. Unfortunately after the chemist had marketed his product, other companies such as Nestle began to develop different versions of infant formula, made from cow’s milk, cream, sugar and water. These days formula is essentially the same thing with added synthetic vitamins and minerals. Formula fed babies in the 19th century and early 20th century had a much higher rate of scurvy and rickets (malnutrition diseases), and like formula fed babies today, they also died in greater numbers and were prone to respiratory illnesses and bacterial infections. But the pharmaceutical industry had caught on to a big money maker so they continued to sell formula to parents. 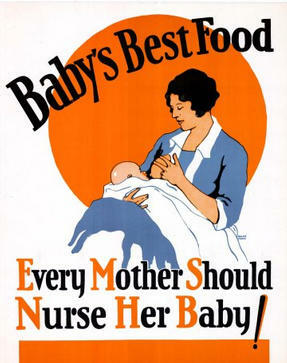 By the 1920’s, parents were advised to add orange juice to their baby’s formula to decrease the risk of scurvy. Through the 1920’s and 1930’s and in some countries, beyond, the majority of artificially fed babies were given evaporated milk. This killed many babies and continued to do so in more recent years. For instance, in a study of the American Journal of public Health in 1971, showed that 30% of 2 month old babies at a New York clinic were fed evaporated milk and in that group there was a significant increase in sudden infant death syndrome. (Rivera J: The frequency of use of various kinds of milk during infancy in middle and lower income families. Amer J Pub Health 61:277, 197). Despite higher death and disease rates, the chemists were raking in profits so they began to advertise formula as the choice for wealthy people (and free breast milk as something that only poor mother’s did), so by the 1950’s, half of all babies were formula fed. 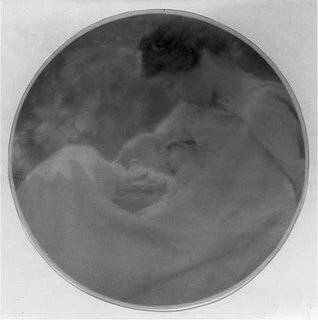 This was coupled with sexually based advertising using large breasted women which meant that the public perception of breasts gradually moved from their intended function, to feed a baby, and breasts began to be seen as primarily sexual objects for men. By the latter 1970’s, use of evaporated milk had stopped and was replaced by store bought brand name formula milk, which a shocking 75% of American babies were fed. This may be one of the reasons why the rate for cancers in the western world is now 1 in every 3. Thankfully, chemist’s don’t own babies. Mothers do, and right from the moment when formula was invented, mothers the world over, and some enlightened doctor’s, have spoken up for breast feeding and continued to nurse their babies. 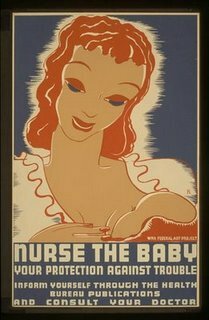 In the 1950’s, support groups in favour of breast feeding began to form in response to the rapidly increasing formula feeding rates, such as La Leche League – named from the Spanish for ‘milk league’ because back then even saying the word ‘breast’ was taboo and that way, group meetings could be advertised in newspapers without causing offence. Still, by 2008 less than 64% of babies are breast fed at birth and most of their mothers have stopped breast feeding by six weeks of age, mostly citing lack of milk supply, a problem found to be endemic where there are ready supplies of infant formula. Medical support for breast feeding is contradictory or unhelpful in a lot of cases, and many new mums were bottle fed themselves so cannot ask their mum for help like previous generations of mothers would have done. And while ‘follow on’ formula’s are still being advertised every day on the TV, babies are still becoming sick and dying. Thank you, Mr. Liebig. More than 6,000 Chinese babies have been taken ill and three have died after being fed contaminated milk formula, with the scandal deepening as it was revealed that a fifth of China’s infant formula producers have made tainted powder. Local officials knew about the problem for more than a month before they alerted central authorities, it emerged yesterday. The safety scare began last week with reports that dozens of babies in Gansu province had developed kidney stones after drinking a formula that contained melamine, a chemical normally used in plastics. Officials said that subsequent tests found affected batches at 22 of China’s 109 milk powder manufacturers, including its two biggest dairies, Mengniu and Yili Industrial Group. The number of affected infants has soared. The health minister, Chen Zhu, said that 6,244 babies had fallen ill, 1,327 were in hospital and 158 were suffering from acute kidney failure. He expected the number of cases to rise. Chen said that so far all the sick infants had consumed milk powder made by the Sanlu group, the country’s biggest formula producer. The Guardian, 18 September 2008. To make matters worse, she said, the donations encouraged mothers to stop breast-feeding their children and instead feed them infant formula. The study found 42.6 percent of infants under five-months-old were fed infant formula after the quake — a sharp increase from the pre-quake figure of 27.8 percent. “We know breast-feeding is very important for children’s health,” Vincent said. The Jakarta Post, 7th July 2008. Babies given formula milk are noticeably deficient in a particular fatty acid. Researchers from the Royal Hospital for Sick Children in Glasgow studying the brain tissue of infants who’d died from cot death found that the percentage of docosahexaenoic acid in the brain was “significantly greater” (9.7 per cent) in breastfed babies, compared to those fed formula milk (7.6 per cent). Docosahexaenoic acid (DHA) is a phospholipid (chemical compound), which makes up about one fourth of brain matter. “Because rapid brain growth and phospholipid incorporation occurs during foetal and early neonatal life, lipid nutrition during pregnancy and early postnatal life may be especially important to subsequent development,” said the research team. In a follow up letter to the study, two researchers from the Institute of Brain Chemistry and Human Nutrition at Hackney Hospital in London concluded that this new data together with other studies comparing cognitive development and visual function, “demonstrate that milk formulae do not match breast milk for optimum neurovisual development.” The study’s author, Dr J Farquharson and his colleague, responded to their results by calling for supplementation of formula milks with DHA. However, the Hackney team, represented by Keb Ghebremeskel, said that their own unpublished study shows that DHA in formula milk substantially “inhibits” the conversion of lineoleic acid, causing a marked insufficiency of arachidonic acid, another essential fatty acid (EFA) in the blood. What Doctors Don’t Tell You, January 1993. A brand of soy-based formula feed has been recalled in Israel after three babies died and others were left seriously ill. The “Remedia” milk, sold as a Kosher fomula feed, was lacking a vitamin vital to brain development. Thousands of Israeli babies are thought to have been given the feed, which is also thought to be popular in orthodox Jewish communities in the US. Food giant Heinz, which owns a stake in the Israeli firm that manufactures it, was said to be “very concerned”. There is no firm proof yet that the absence of the vitamin, B1, from the feed was the reason behind the deaths and illnesses. Two of the babies who died had other illnesses that might have contributed to their deaths, said doctors. A deficiency of B1 in infancy can cause a condition called Beri-Beri, which can kill. Parents of children given the formula have been urged to take their babies to the doctor for booster shots of the vitamin. BBC News, 11 November 2003. Formula Feeding Increases American Infant Death Rate by 56%! A study entitled ‘Breast Feeding And the Risk of Post Neonatal Death in the United States’ found that formula fed infants had a 56% higher death rate than breast fed infants. Breastfed infants in the United States have lower rates of morbidity, especially from infectious disease, but there are few contemporary studies in the developed world of the effect of breastfeeding on postneonatal mortality. We evaluated the effect of breastfeeding on postneonatal mortality in United States using 1988 National Maternal and Infant Health Survey (NMIHS) data. METHODS: Nationally representative samples of 1204 infants who died between 28 days and 1 year from causes other than congenital anomaly or malignant tumor (cases of postneonatal death) and 7740 children who were still alive at 1 year (controls) were included. We calculated overall and cause-specific odds ratios for ever/never breastfeeding among all children, conducted race and birth weight-specific analyses, and looked for duration-response effects. RESULTS: Overall, children who were ever breastfed had 0.79 (95% confidence interval [CI]: 0.67-0.93) times the risk of never breastfed children for dying in the postneonatal period. Longer breastfeeding was associated with lower risk. Odds ratios by cause of death varied from 0.59 (95% CI: 0.38-0.94) for injuries to 0.84 (95% CI: 0.67-1.05) for sudden infant death syndrome. CONCLUSIONS: Breastfeeding is associated with a reduction in risk for postneonatal death. This large data set allowed robust estimates and control of confounding, but the effects of breast milk and breastfeeding cannot be separated completely from other characteristics of the mother and child. Assuming causality, however, promoting breastfeeding has the potential to save or delay approximately 720 postneonatal deaths in the United States each year. Yes, you read that right, breast feeding can save up to 720 lives a year! A premature baby in New Zealand died in July 2004 after being fed formula milk which contained a meningitis bacteria. A premature Waikato infant who died of meningitis. The death was caused by Enterobacter sakazakii sourced to powdered infant formula used in providing care for the baby. Along with any notification of any instances of the disease, the report also recommends each notification be investigated and efforts made to trace and isolate the source of infection. In 2004 the Ministry and the New Zealand Food Safety Authority advised all neonatal intensive care units against using powdered formula for pre-term babies where an alternative was available and reinforcing good hygiene practices when preparing formula. Ministry of Health Media Release, 5 April 2005, New Zealand. Dewey KG, Heinig J, Nommsen-Rivers LA. Differences in morbidity between breastfed and formula fed infants. J Pediatr 1995;126:696-702 (risk also increased in FF infant for otitis). Duncan B, Ey J, Holberg CJ, Wright AL, Martinez FD, Taussig LJ. Exclusive breastfeeding for at least 4 months protects against otitis media. Pediatrics 1993;91:867-72. Koo WWK, Kaplan LA, Krug-Wispe SK. Aluminum contamination of infant formulas. J Parenteral Enteral Nutrition 1988;12:170-3. Let’s recap, according to the pro vaccine information, between 1 and 3 infants a year die of whooping cough in Canada. 720 babies die from not being breast fed every year in the States. Which do you think is more dangerous? Mothers are frightened of the diseases and so will vaccinate, but many of these mothers bottle feed, not knowing their baby’s risk from this is greater and health departments do more to promote vaccines than they do to promote breast feeding.